Our titles are available for purchase at Amazon. Rosemarie Dombrowski’s The Book of Emergencies is a first book from an already well-established poet in the literary worlds of Phoenix and Tempe, Arizona. In this work, her poetry dwells between the verbal and the nonverbal through her creation of gripping symbols to represent the everyday life she shares with her autistic son. The result is a lyrical, visceral dance that entices the reader into a music-world of language to sway together with Dombrowski and her son as they navigate the hostilities of medical specialists, the ignobilities of the body, and discover a makeshift communication of sounds and images, where we hang precariously, along with her, between the good days and the bad ones. A portion of the proceeds from this book will go to support autism advocacy and research. In these poems, Kyle Laws excavates the Western landscape to reveal the effects of the atomic bomb. Here is the Trinity site. Here are poems about the pictures taken of the blast, testing the bomb that would go on to be dropped on Nagasaki. Here are those vast deserts of the early- and mid-twentieth century with the personalities who populated them: J. Robert Oppenheimer, Georgia O’Keefe, Zane Grey, and John Wayne. Laws’ poems explode on the page; one even plays with form to mimic the atomic reaction of nuclear energy, words whipping up energy as they are scattered across pages. 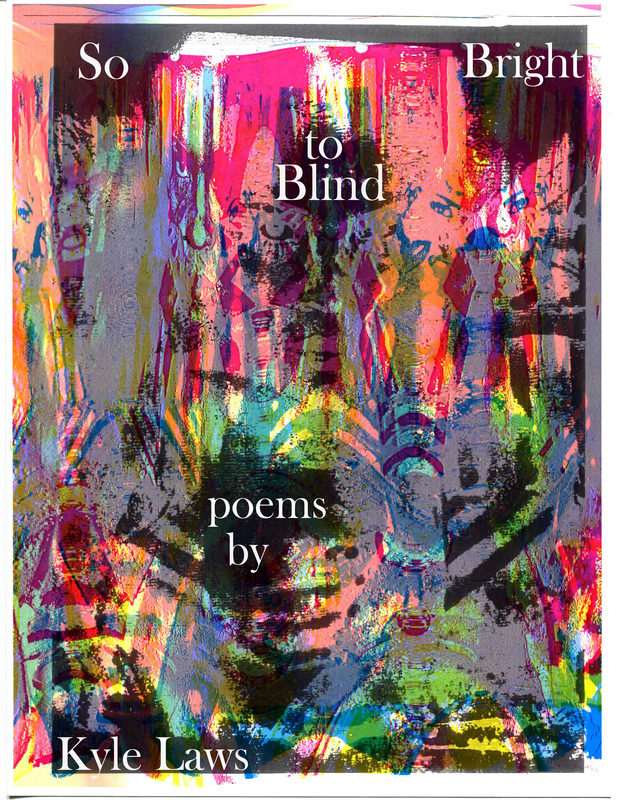 Kyle Laws’ So Bright to Blind also chronicles what we lose as a society when our frames of reference are too narrow, and, when this is the case, the preserving role of art as witness and as a reason to keep living despite the ravages of our “science” to the earth and human bodies. She juxtaposes American efforts to achieve civilization through technology, food, and art with our atomic bomb design, whose “firing mechanism was only / an elaborate gun.” In doing so, Laws catalogues a raw episode in American history when, in the name of progress, our Western “shoot-em-up” attitude finally went too far. 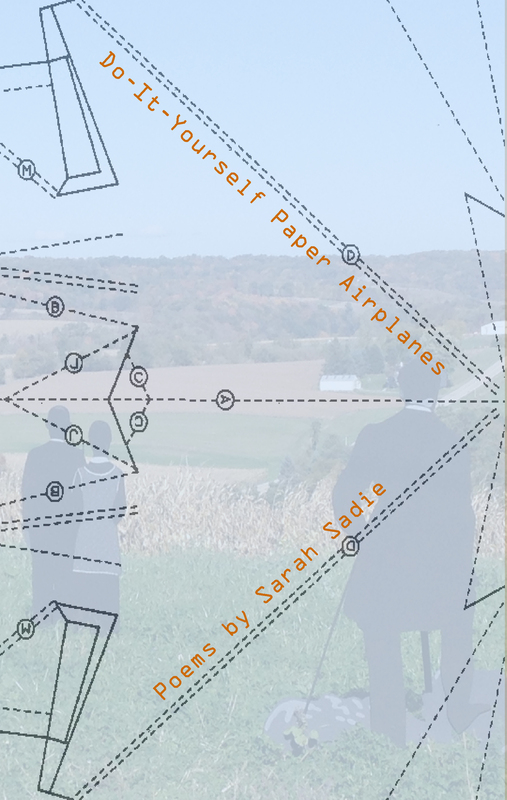 Having spent the last few years as Poet Laureate of her city and co-editor of a print and online hybrid poetry journal, Sarah Sadie returns here to the familiar ground of the lyric, but with a difference. These poems split their attention between the world that awaits us each morning and the act of writing itself, asking What are we doing in this world? What are we doing in this poem? When are those questions the same? Winner of our 2015 “Spring is the Mischief” Contest! The poems in Well Enough to Travel are lashed together with lyrical lines that seethe, pulse, rise, and descend through love and loss, disappointment and desperation. 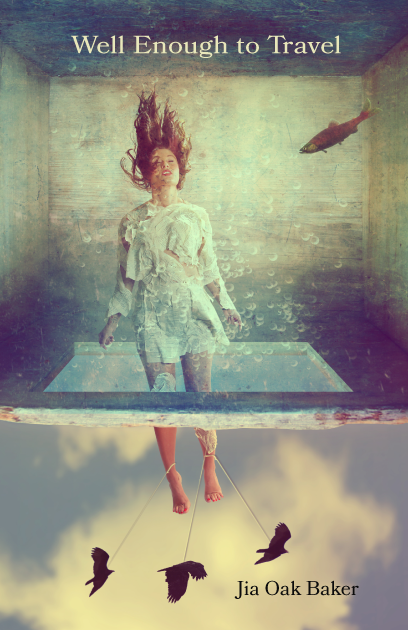 To travel is not to wander or explore, but rather to search for one’s self—to choose to die and be renewed, Ophelia resurrected. In her second chapbook of poems, Jia Oak Baker constructs well-wrought images with emotional resonance, sometimes surreal, to give insight into how relationships deteriorate—how the whale mouth of expectation swallows us whole, how we all drown there, and how we save ourselves afterwards. 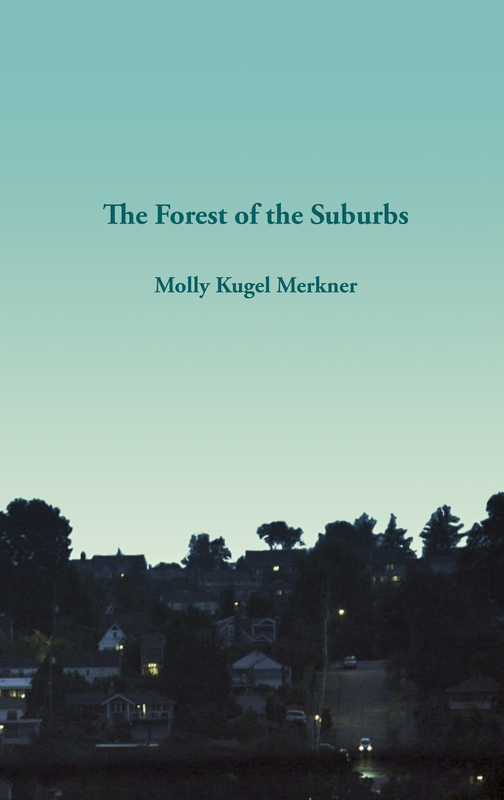 In The Forest of the Suburbs, Molly Merkner identifies the liminal spaces where human civilization encroaches on animal habitat. She mines those spaces for their images and pathos, finding moments of connection and understanding, as well as sorrow for how our technologies are often so hostile to nonhuman life. Winner of Our 2015 “Our Wish For Blue” Summer Contest! Michael Tugendhat’s poetic oeuvre is about the limits of the human body that place us into contact with the world, with other sufferers. What I’m Afraid to Show You shows us hidden wounds and the parts of our pathologies that hide in plain sight. It brings together two contradictory ideas: that the gaps and spaces of the body that can be cleansed are also those that can be contaminated, and that both processes entail an ache: “pure / all that impurity washed away / like ice cold water through / a missing tooth.” Central to this ache is the desire for the gaze. Tugendhat’s poems become window panes through which we watch ourselves watching—where looking becomes part of a shared documentary experience, and how fragmented and fused the language must be that records the watching. Food is an important vehicle in What I’m Afraid to Show You; it is through the common act of consumption that the self can stand to be with other bodies as mortally frail as one’s own. In this collection, Tugendhat crafts a poetic memento mori that helps us mourn those things whose value we couldn’t sense until their moment had passed. The Last Pub on Earth resurrects Peter Murphy’s alter-ego, Garry Morgan, a persona he adopted and abandoned decades earlier while living as an undocumented worker in Wales. Part Prufrock, part Pinocchio, Garry Morgan is ridiculed, pitied, and comforted before finally laid to rest. These poems conjure the fragmented postmodern identity and raise questions about what we owe to a self we’ve invented, outgrown, and left behind. This freewheeling reverie reimagines life before the ground-zero of Murphy’s recovery from alcohol addiction, a journey whose first step was taken on the feast day of St. Govan, whose chapel is depicted on the front cover. In Faithful as the Ground, Shawnte Orion turns the domestic into the carnivalesque. He gives us the dust mites and bed bugs of the human condition that add up like the sodium in a bag of pretzels, the guilt in a conversation with mom, and the five hours of energy promised up by a 5-hour energy drink. Sleepless nights turn into contemplations of mortality in this memory-driven collection, whose final message is that the detritus lying in the nooks and crannies of our homes tells us who we are and how we got that way. The back cover of this book also contains a highly unique blurb done by Charles Jensen (author of The Nanopedia Quick-Reference Pocket Lexicon of Contemporary American Culture: MiPOESIAS, 2012) in the form of emojis. The latest poetry collection by the author of the Lew Griffin mystery series! James Sallis’ latest poetry collection is a study in gothic noir where post-war trauma surfaces in a speaker’s haunted relationship with time and space, where the familiar is strange, and the strange is familiar. In Night’s Pardons, Sallis writes of the “terror of the ordinary,” the things that keep us up at night, that populate the darkness waiting for an absolution we cannot muster, from which we can find no peace except in the language of poetry itself. Winner of the 2015 “Say Elves” Poetry Contest! Elizabeth Tornes’ Between the Dog and the Wolf celebrates the richness of life’s twilight spaces: the transition space of August between summer and fall; roadsides, where the travel paths of humans intersect with those of animals; varied terrain—from yurt to creek— and the diversity of earth’s bounty. Her poems reflect on the process of language itself, as the Ojibwe language blends with a secret language of the natural world. In this reverential way, Tornes turns the skill of her poetic eye on the contemporary life of Native Americans in northern Wisconsin. She takes us to pow wows, shows us boarding school beatings, honors the Ancestors. As refreshing as an unexpected summer rain, Between the Dog and the Wolf lets us into a world where people are predominantly good to one another, recognizing the divine in each living thing. And it’s this sanctity of life that allows her poems not only only to speak, but also to listen. Just like Dickinson’s famous line about the slant of light in late afternoon when “the landscape listens,/ Shadows hold their breath,” these pages are the meeting place between this world and the next. Throughout The Route to Cacharel, Nickel poses a central question: “the dead speak if we listen, but how do we hear them in the cackling of the modern world?” The answer is found in the particulars of the natural world. Spiritual yet visceral, these powerful poems offer comfort: “There is someone whispering over a candle perhaps for you too.” If as Nickel observes, “in the end, we are measured by our generosity,” this magnificent collection lights not just one but a multitude of candles to guide us in the dark. Like one of its characters, The Route to Cacharel balances “the knowing with the longing.” Here is history and yearning amid the vividly rendered but insufficient pleasures of the present. “We are unable to resign ourselves to the end / Of what we love”—yes. These ambitious poems offer things to savor, things to grieve, and much, much to ponder.